Studies show seat belts do save lives and reduce injuries during crashes. Seat belts work with air bags to protect occupants. Air bags alone are not enough to safeguard occupants. More than 2,000 unbuckled drivers and front seat passengers died on New Jersey's roadways in the past 10 years.Approximately 700 unbuckled drivers and front seat passengers were thrown out of their vehicles during crashes and killed in the past 10 years. Applies to all passenger vehicles including vans, pickup trucks and SUV's, that are required to be equipped with seat belts. Applies to all passengers, who are at least 8 years of age but less than 18 years of age, and each driver and front seat passenger of a passenger automobile, operated on a street or highway. All of these occupants are required to wear a properly adjusted and fastened seat belt system. On January 18, 2010, legislation was signed into law requiring all occupants to buckle up, regardless of their seating position in a vehicle. A secondary offense, the new law allows police to issue summonses to unbuckled back seat occupants, 18 years of age and older, when the vehicle they are riding in is stopped for another violation. The law is effective immediately. Makes the driver responsible for proper seat belt use by all occupants who are under the age of 18. Children up to age 8 or 80 pounds must ride in a safety or booster seat in the rear seat of the vehicle. If there is no rear seat, the child must sit in the front seat secured by a child safety seat or booster seat. Passengers age 8 to 18 (regardless of weight ) must wear a seat belt anywhere inside a vehicle. 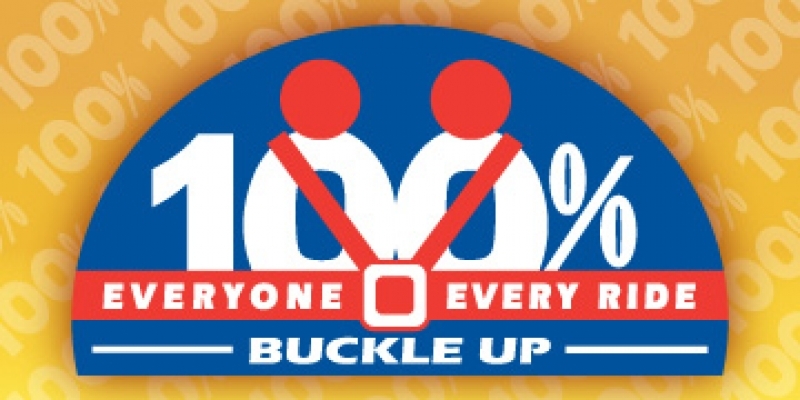 Click It or Ticket An annual nationwide campaign that incorporates zero-tolerance enforcement of safety belt laws with public awareness efforts and the support of government agencies, local coalitions and school officials to increase seat belt usage.